The Prophet Rael Is sending his support this week to Matt Allsup, 13, and his mother after he showed up to his Hamilton, Ohio (USA) school wearing makeup and was told it was not allowed. He was wearing black eye makeup, lipstick and nail polish. The boy’s mother asked the school administrators why they banned him from wearing makeup and she was told that because it was black and distracting. She was quoted as then saying “Well, I’ll get him pink”. 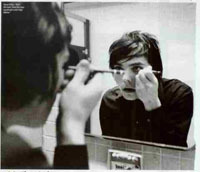 It was then that administrators came forth with the real reason – because he is male, he’s not allowed to wear makeup. His mother plans to get an attorney to take the case to court. We send mother and son our support and are confident they will win such an easy case since this is clearly sexual discrimination. It’s no different than when women, thus girls, started wearing pants decades ago. The traditionalists were against it but women stood up for their rights. Go Matt! Matt not only has the right idea when it comes to equality, but more importantly, to be more feminine. Rael has been giving this powerful advice for many years – that femininity will save the planet since there is far too much machismo on Earth. Instead of women imitating men in order to compete in society and the work force, it should be the opposite. Men should be imitating women. Men have soooo much to learn from women! Delicacy, refinement, grace, softness etc. If these characteristics were applied by men, can you imagine how much less violence we would have?